Too Busy for the Dentist? How We Can Help. We know how much easier it is to stop by our office now that we are just a walk from downtown Boise. Just take a quick drive from your downtown Boise office to see Dr. Robert Studebaker for a Boise cosmetic dentistry appointment, or get a quality Boise dentist’s teeth whitening with Dr. Carson Mooney. Idaho residents don’t have to live in Boise to take advantage of our quality service, however. Our office is located right off Interstate 184, meaning out-of-town residents can easily zip in and out of our office without getting bogged down by city traffic. Once you’ve gotten to our office, however, we make sure that you get all the work done in a day. For a crown, that means using CEREC digital impressions. How CEREC digital impression works starts with Dr. Robert Studebaker or another Boise dentist running a CEREC wand over your teeth to create a digital impression. From there, we use the CEREC digital impressions to custom-create the crown you need. It’s then sent to our in-office CAD machine that quickly and beautifully creates the perfect crown. We’ll permanently cement it in place the same day. 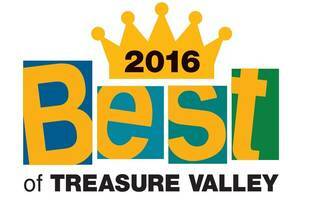 If you’ve been to our Boise office, you know how incredible our office staff and hygienist team are. This is the final way we do our best to keep you happy and on-schedule. You know how hard our office team will work to ensure that you get the appointment you need when you need it. And we’re proud to say that our hygienists are some of the best in their field. If you are under a deadline, you can count on them to cheerfully and efficiently get you the care you need in the time you have! Have any other concerns about getting the dental care you need? Chat with Dr. Robert Studebaker, or talk about your dental care options with Dr. Carson Mooney. Idaho and Boise patients like you have our entire team at your disposal so that you get the care you need. We hope to see you soon! One thing we love about our location is how it puts us right near the center of downtown Boise. We thought we’d share some of our favorite downtown haunts! Image via Flickr by Ken Wilcox. If you are looking for a great place to go out for dinner, the Fork Restaurant is just five minutes from the Summit dental office! We love how they celebrate northwest American cuisine with dishes like Boise trout and smoke-grilled artichoke. And their butter cream cake is fantastic, too. They also always have a great selection of regional beers and wines. In the same block, we also love Bittercreek Alehouse and the Ruth Chris Steak House. If you are looking for a place to go shopping, the 8th Street Marketplace is within walking distance from our office and includes shops like LOFT, White House –Black Market, Urban Outfitters, and other local boutiques, including Swank Boutique, and Piece Unique, and Miss Molly. Walk just a few blocks north, and you’ll find yourself in the midst of Anthropologie, Chico’s, The North Face, and other stores. Looking for a great place to grab a cup of coffee? We love to hop across Front Street for an espresso and Croque Monsieur. They’ve also got a great selection for lunch and dinner, and it is easy to pick something up that is fast and delicious. For breakfasts, Big City Coffee in the Linen District is just as awesome for a big breakfast—the coffee is fantastic, the atmosphere friendly, and the portion sizes are huge! What about you? What places do you love to visit around the Summit Dental Office? So you got a few hours off from work for your Boise dentist visit, and you want to wait for the anesthetic to wear off a little more before you head back to the office. Here are some things you can do after your visit! Just north of our office is the amazing Goody’s Soda Fountain, where you can get old-fashioned homemade ice cream and sundaes. If you are more of the frozen yogurt type, head to Blue Cow just southeast of us. Looking for more desserts? 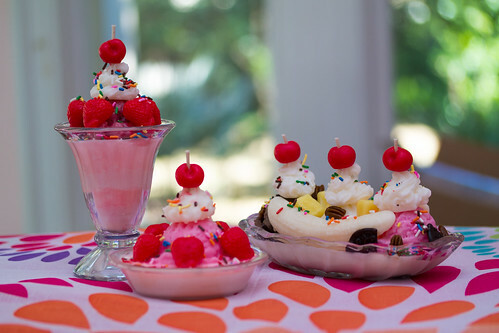 Check out this article for more of our favorite dessert places. If you’ve got kids with you, walk across the bridge over the Boise River to Ann Morrison Park. Bring a picnic blanket and lay out in the sun if you are tired, and let your kids run around the grassy areas. You can also follow the Boise River just a little bit south to the Julia Davis Park, which has beautiful gardens, a playground, and a duck pond. If you don’t want to lounge on the couch at home, you can relax and watch the latest releases at the Regal Boise Downtown Stadium. More of an indie moviegoer? The Flicks is located just on the edge of Julia Davis Park. Watch a movie on one of its four screens, or rent an indie movie to take home. If you are feeling energetic and curious, take advantage of your time off and visit one of the many museums in the downtown area. Within the Julia Davis Park, there are three museums: the Idaho State Historical Museum, the Black History Museum, and the Boise Art Museum. Go just two blocks north, and you’ll find yourself at the Basque Museum. Where would you go if you had some free time after a dentist visit? By bringing your kids to the dentist for a first appointment at a young age, your kids are more likely to always feel comfortable in the office. Several professionals recommend taking your child to the dentist for the first time when they are one years old, or when they get their first tooth. Our Boise dentists will count their teeth and help them get acquainted with the office. You can also help your kids understand how a dental appointment goes by playing pretend at home. For example, you can pretend to be the dentist and use a toothbrush to count your kid’s teeth, and then you can have her be the dentist and pretend the brush her favorite stuffed animal’s teeth. Our Boise dentists love having a kid-friendly office, complete with a kids waiting room, televisions on the ceiling, and other ways to help kids have fun. That also means that our dentists know how to help kids feel most comfortable during a dental appointment, so let us choose the vocabulary of the appointment. For example, we don’t use words like “shot,” “hurt,” or “pain.” Instead, we say things like “sugar bug” for cavity and “painting the tooth” for the cavity filling process. We’re also used to kids whining or wiggling, so we know how to do our work while keeping your kids comfortable. That means we might request that you take a step back, or that you take a seat and hold your child’s hand. Just relax and watch us for cues! Wondering what a kid’s appointment looks like? You can take a walk through a kid’s appointment, a blog we wrote to help you know what to expect. Kids can pick up on your fear, spoken or unspoken, and your fear will color their interpretation of any situation. A recent study found that if a dad is anxious at the dentist, their children will be, too. Even if you don’t say anything, kids can pick up on negative body language and other signals that you are feeling fearful. On the other hand, if you are relaxed and at ease, your kids will be, too. Bribing a child by saying things like, “If you are good, you’ll get a lollipop after this,” is a pretty common way to buy a kid’s cooperation for something they don’t want to do. And that is why you shouldn’t offer any bribes for a child’s dentist appointment. Our Boise dentists work very hard to make sure that our children’s appointments are fun and relaxing, so there shouldn’t be any need for a bribe. And by offering a reward, you may give your child the impression that the appointment is something to dread—something that warrants a bribe! And besides all that, promising a sugary treat after a dentist visit is counterproductive. With such a fun office and such incredible staff, we at Summit Dental do our best to make a kid’s appointment amazing, but you can help us make it even better with these four ideas. 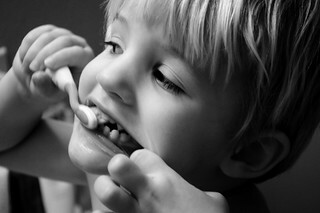 How do you help kids learn to love the dentist? Spacious rooms: The new office patients’ rooms are large, comfortable, and quiet. Hardwood floors, natural light, and plenty of extra floor space and seating help patients to sit comfortably during appointments. This allows for more relaxed dentist and patient interaction, which is greatly appreciated on both sides. Top-of-the-line technology. In addition to spacious rooms, we are very excited to work with the latest dental technology in each patient room. One of the features that is most convenient are the large format computer displays; these are used to show patients intra-oral camera pictures of what we are seeing, and it really helps us communicate problems we are seeing in the mouth. Many diseases cannot be seen when we examine the mouth, so these pictures and x-rays help us see small areas of decay between teeth, bone loss caused by infection or gum disease, and many other things, including the position of unerupted teeth. The large format screens allow us to then demonstrate the problems we see in the mouth so that our patients can clearly see the problem, and then we can work together to resolve it. The Summit team. Finally, by working with such experienced clinicians, we can share ideas on treatment decisions with each other and learn from each other’s experiences. This helps us find the best possible treatment for every patient. Also, working with such a friendly and outgoing staff really helps create an enjoyable environment to work in on a daily basis. Last but not least, we love being a part of a dental practice with such a long standing of 35 years, and which has an established reputation of being a high-quality and friendly office, with truly great patients. We are excited to carry on the Summit reputation in a new location with the same great service, staff, and patients! 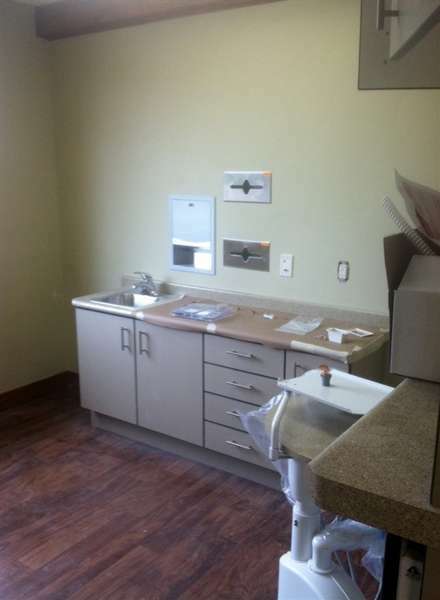 Privacy, Comfort, Technology: A Perfect Recipe for Great Dental Patient Rooms! Privacy. Floor-to-ceiling walls make sure every patient has the privacy they need during their dental visits. With private patient rooms, patients will not be disturbed by other’s appointments, and patients will not have to worry about sharing space. A quiet and peaceful environment makes every appointment better for the doctor, patient, and family members! Don’t forget about our private patient check-in and check-out as well. Comfort. Not only is each patient room very private, our patient rooms are also spacious and relaxing. Appealing wall colors, dark wood floors, and plenty of natural light make these rooms warm and inviting. Our patient rooms are also easily accessible from the waiting room, so no squeezing around furniture or zigzagging through several narrow hallways. Technology. Of course, what can help a patient relax more than a movie or TV show? Each patient room is equipped with a flat screen television attached to the ceiling, and patients can choose from our many satellite TV channels, or they can decide on a movie to watch during the entire appointment (we have plenty of options for kids and adults). So be sure to bring your headphones! Not only do we offer the latest technology for watching movies, we are also proud to have top-of-the-line dental technology throughout our Boise office. Each patient room is equipped with the latest dental technology so that every appointment can run smoothly, without relying on borrowing equipment from room to room. Between our beautiful and natural room designs, private patient rooms and check-in, and latest technology, we are confident every patient will feel comfortable and relaxed at our new office space. Don’t just take our word for it, though—stop by and check it out for yourself! We’d love to say hello and show you around. With an official move-in date of August 8th, we at Summit Dental are listing off our favorite things about the new Boise dental office. First things first—location! Located at the corner of Shoreline Drive and Americana Boulevard, our new Boise dental office is even easier to get to from the downtown area and from out of town. For those who need to make a dental appointment in the middle of the workday, our location in downtown Boise makes it easy for professionals to leave work and come into the office. In fact, the drive from Central Downtown or the Westside District is under four minutes! Our close location to the Connector, however, makes it easy for those coming in on I-184 to get into town and to the office quickly. 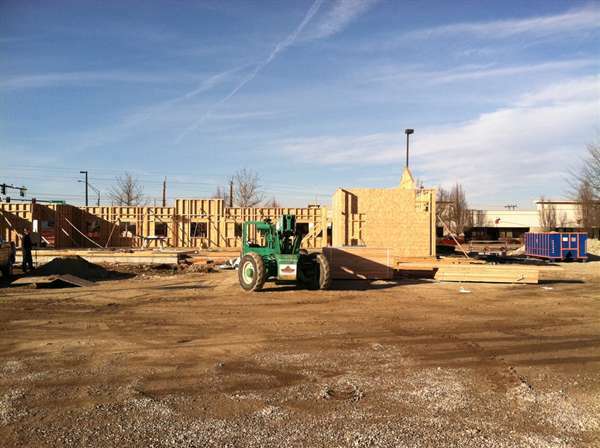 The drive is only five minutes from the junction of I-84 and I-184 at the west of town. Foot and bicycle traffic will have just as easy a time with our location along the Boise Greenbelt in Ann Morrison Park and Kathryn Albertson Park. Pedestrians and cyclists can easily reach our office by crossing the river and walking east for a half block. Easy access to bike parking makes our new dental office an even friendlier place for patients coming via bicycle. 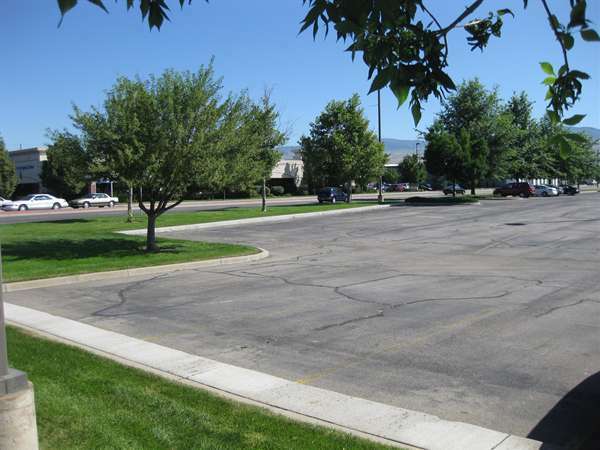 Of course, increased parking offers better convenience to our patients who drive to our Boise dental office as well. All parking is well lit. Once you get inside the building, our new modern facility is spacious and energy-efficient. Two waiting rooms (including a special waiting room designed for kids), and private patient check-in and check-out give you a relaxing and private environment before and after appointments. Private and spacious patient rooms makes sure your appointment is relaxing and enjoyable as well (we can’t want to tell you more about our patient rooms next week!). Efficient and effective temperature control also makes sure that all patients are comfortable no matter when their appointment is. We are certain our new Boise office location will help patients get to and from our office even easier. Be sure to stop by our Grand Opening Open House on August 8th from 3 p.m. to 7 p.m. We can’t wait to show you around! A welcoming waiting room. Not only will we have a comfortable waiting room, the space will have expanded so that kids can have fun at the dentist with a kid-friendly area complete with soft flooring, toys, and a television that shows favorite Disney and Pixar films. Patient-centered staff. If anything, being in a space that is tailored to be exactly what we need may make us even more enjoyable to be around! We don’t just want to take care of your teeth; we want to hear about your family, your summer vacation and everything in between. Our patients are the heart of our work, so we want to form long-lasting relationships that allow us to really know our patients! A fun-loving office environment. With such an outgoing staff, it is hard not to catch the atmosphere of fun that our Boise dentists, hygienists, and office workers create. Office staff at the front desk welcome patients into the office before our hygienists sit and talk with them in the dental chair. Finally, our Boise dentists are personable and relaxed. If you want to see just how much fun we have hanging out together, head to our Staff page to see pictures of our dentists, hygienists, and office staff. Whether it is our interaction with you or with each other, you can’t help but notice that we love our job. We may be moving to a new building, but our signature office environment full of welcoming spaces and friendly staff is one thing we are certainly excited to be taking with us. What are you hoping to see in the new Boise office? 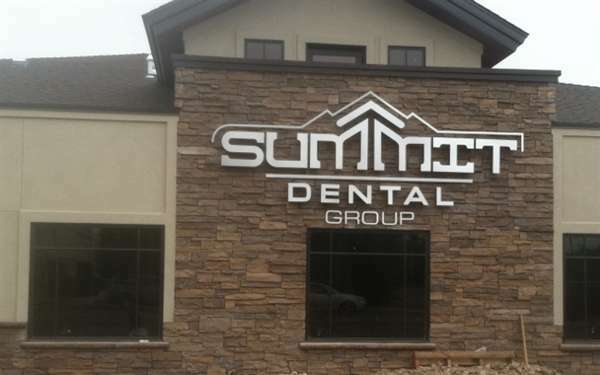 Summit Dental will be breaking ground on our new office building starting next month. We are all very excited and we will continue updating everyone as the building progresses. Right now we are just looking forward to breaking ground! !